This actually ended up being the event that sparked the birth of The Silvers! 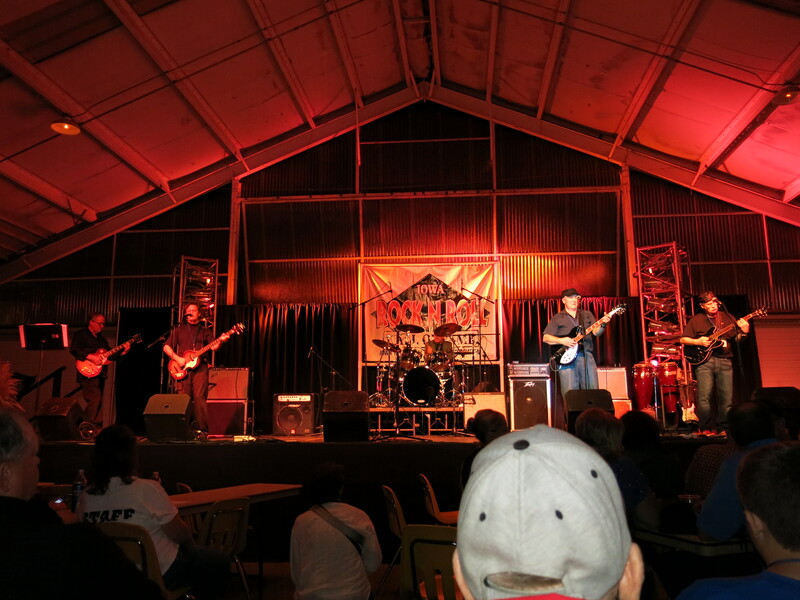 Here is a picture of Silver Laughter onstage in August of 2014 for the IRRMA Hall of Fame induction concert. From left to right are Mark Zaputil, Mick Orton, Paul Staack behind the drums, Jon Ludtke and Kim Ludtke. In the audience to the right of my wife (who took this snapshot) was future guitarist for The Silvers, Tom Kelley, and his wife, Michelle. When lead guitarist, Ken Wiles, said he would not be attending the event, I lobbied for Tom to fill in. To his relief (which would have meant coming to Davenport to rehearse not to mention the time he would have had to spend learning our set of songs all while trying to hold down a job), the other band members sidestepped my request and decided to go with the lineup you see here. After all the work it took me to get back into performing shape, I didn’t want to go back into hibernation. Besides, Ken and I had written some really good songs during our Double Shot days that might never be heard. Tom and I discussed recording together again. We decided that even with such a long distance separating us, technology now allowed us to share files across the Internet. Besides, he and I had also collaborated on a few TODD songs that might now see the light of day! Shortly after the induction ceremony, I was contacted by Ricky Zero through e-mail. Though we had never met, I saw some of his work with other bands in Atlanta on Facebook. We asked him to join our project. As it turned, out he has tons of connections which allowed us to move forward so quickly. Then after our first single was released, I learned that our old Silver Laughter sound and light man, Glenn Stone (AKA The Punk), was a drummer. It just made sense to draft him for this endeavor. So now The Silvers are making new music. Our first album is almost done. Our second animated video is on its way. Each of us has been writing new songs. And we have a surprise in the works for the holidays. It could not be a more exciting time for us! Here’s a little side note; the amplifier behind Jon looks a lot like the one I used for Silver Laughter performances. In this insurance photo taken by Carl Frisch, it shows the Peavey “coffin” I brought with me from Tabernash. Not long after that it was replaced with the slim cabinet you see behind Jon. Carl added wheels to make it easier to transport, something I don’t think Peavey ever incorporated. ‹ The Silvers and Silver Laughter Website Hits 60,000!